Our practice has grown and in order to continue providing you with the best standard of care, we are bringing on a new dentist. We are very excited to welcome Dr. Matt Yurchak to South Suburban Dental. Born and raised in the Chicago land area, Dr. Matt graduated from Illinois State University, where he then went on to complete dental school at Midwestern University-IL. During his time at Midwestern University, Dr. Yurchak had extensive training in diagnostic/treatment planning, restorative/cosmetic dentistry, dentures, rotary endodontics, oral surgery, Invisalign, lasers, implants, new and upcoming digital scanning technology. In his free time, Dr. Matt enjoys spending time with his friends and family, volunteering throughout the community, exploring downtown Chicago, spending time on the golf course, and is an avid sports fan of the Chicago Blackhawks, Cubs, and the Bears. 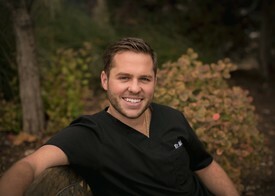 Dr. Matt Yurchak is passionate about helping his patient’s achieve the best oral health they can achieve. His dental philosophy involves putting his patients in a position to succeed by managing his or her individual oral health care with the guidance of the dental team. Understanding his patients’ needs and expectations are a necessity so that he can ensure patient satisfaction. He enjoys getting to know each of his patients on a personal level allowing him to not only understand their dental expectations and knowledge, but their personal interests as well. This relationship allows him to create a personalized treatment plan to cater to each of his patient’s specific needs. His overall goal is to have every one of his patients leave the dental office with a smile on their face that they love and want the world to see. Dr. Yurchak also believes strongly in continuing education to not only make himself the best practitioner he can be, but to also stay on top of the ever changing landscape of dental materials and technology.